The dice game Shut the Box also goes by the names Canoga Card Sharks, Tric-Trac and Batten Down the Hatch. Traditionally the game is played with a specifically made play area that consists of a dice rolling area and a side area of 9 hinged flip up or slide cover tablets, each tablet numbered 1 through 9. Getting your hands on one of these traditional play boxes may be difficult, so we’ll also be covering how you can play with pen and paper. Shut the Box is best enjoyed by two, three or four players and can be played as a gambling game (popular with sailors). Playing Shut the Box is a fairly simple affair with the overall aim of the game to cover all nine numbers by repeatedly throwing the dice. Numbers covered are simply those appearing on the dice themselves, or ones covered by the adding up of both dice (using the total dots and splitting them accordingly). 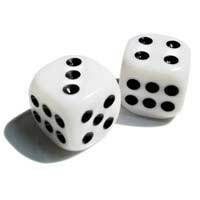 The player will continue until he / she can cover no more numbers with the dice roll, be it by the covering of all, or by the numbers on the dice not matching any of those remaining on the box. It should also be pointed out that if the player manages to cover the seven, eight and nine during their turn, it is then up to them whether they wish to continue play with one or both dice. To make your Shut the box game out of paper, simply write numbers 1 through 9 on nine equally sized pieces of paper and place this in numerical order to the side of the playing area. As opposed to most traditional dice games, scoring in Shut the Box is the lower the better. With the overall aim of the game to shut all the boxes (cover all the numbers) leaving the player a score of zero. Numbers that are left uncovered at the end of a players turn are added up on a score sheet in similar fashion to the card game Uno. The person with the lowest score wins the round. In gambling terms, the player who succeeds in closing all the boxes in their turn wins immediately and the other players have to pay them double the original stake. Closing the 4 and 2 and 1. All of the numbers you chose to cover however MUST be uncovered, so for example a player rolling a total of 7 on the dice cannot choose to cover 4 and 2 if 1 is already covered. All number combinations must be available, thus the strategy of the game. The main variant game to Shut the Box is ‘the long game’, which is undertaken by only two players. The same rules apply, but after player one covers as many numbers as possible, it is the other players job to try and uncover them and play continues in this way until one or the other succeeds in covering or uncovering all tiles. The only addition to this variation is that throwing a double on the dice will gain the player an additional throw. Another variant to Shut the Box is ‘the long score’, in this variation, rather than numbers simply being added together, they are read directly from the box as seen. For example a player usually left with the 1, 5 and 7 showing would score a total of 13 points, but in the long score variation, the player receives 157 points.